After some busy, active days on horseback and wine tasting on bike, I needed some time to relax and plan the next leg of my journey. Originally, I’d hoped to visit my friends in Buenos Aires, but I continued to hear horror stories about how much the city had changed in the last few years and how dangerous it had become. Two Canadians staying in my hostel in Mendoza had been robbed of all of their things inside their hostel in Buenos Aires, and it was all caught on the hostel’s surveillance videotape! They had put down their large backpacks while waiting to check in to their hostel. The reception area was busy, hectic, and understaffed, and there were a lot of guests waiting around. Four thieves dressed in normal street clothes had walked in, hoisted on the Canadians’ backpacks, and walked out. Luckily, my friends had still been wearing their small backpacks with all of their most valuable possessions, and they had also bought travel insurance to help them replace what had been stolen. Surprisingly, they even had a sense of humor about the situation, and acknowledged that it had helped them become very minimalist during their long-term backpacking trip! I spent a relaxing morning in the hostel researching what I still wanted to do while in Mendoza and thinking about my next destination. I had originally wanted to go hiking in the area, but there weren’t enough interested guests to send out an excursion. I’d thought about going rafting or rock climbing, but the cost was more than I really wanted to spend so early on my travels. 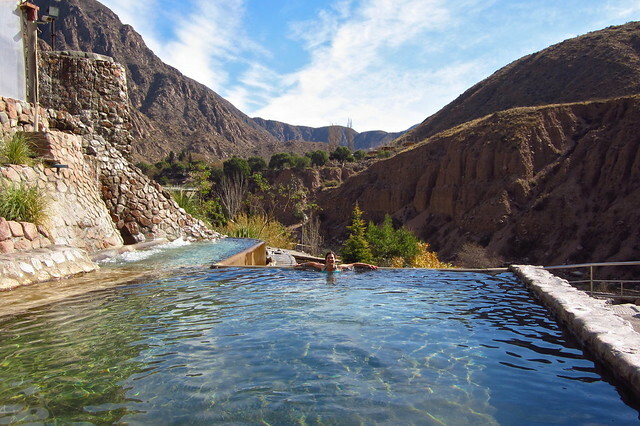 In the end, I decided to visit the hot springs and thermal baths in Cacheuta, an easy journey from Mendoza. 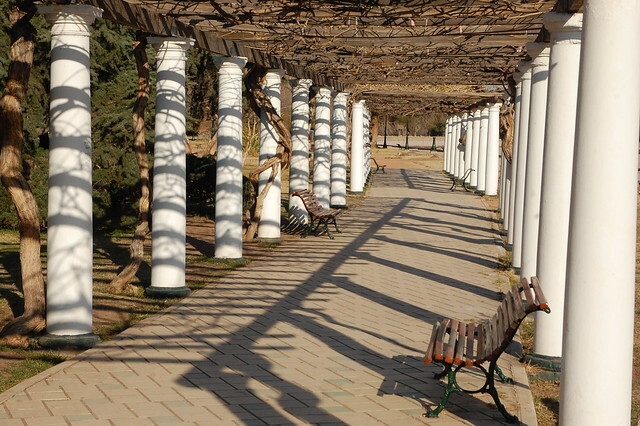 But first, I chose to explore the city on foot, wandering through its streets en route to Parque San Martín, Mendoza’s massive multi-use public park. One of the reasons I went there was nostalgia; I’d taken photos with my friends under these archways in 2002! But mainly I went because I wanted to be outside in the fresh air and sunshine, perhaps to read my book by the river. As I wandered, I spotted an outdoor dance class and saw a sign for yoga in the park. I saw tons of runners and bikers enjoying the wide roads with no cars on them. It was a lovely way to spend the afternoon and experience Mendoza’s version of winter. 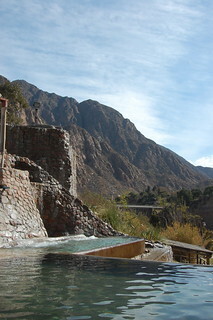 The next day, I got up early, excited to relax in the hot springs of Cacheuta. I ended up tagging along with two older American friends whom I’d met at the hostel. However, we left a little later than I would have liked, ended up getting stuck in traffic on our way to the bus terminal, and almost missed the last morning departure time! Luckily, we ran through the terminal, found the right bus just before it departed, and were able to get our tickets on board. 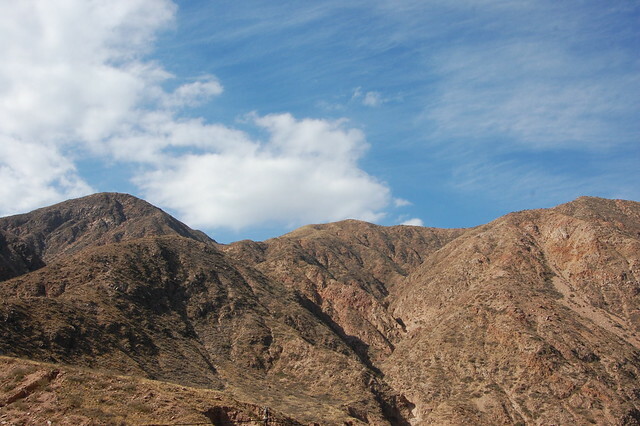 The 90-minute ride through the landscape of Mendoza province is absolutely gorgeous. 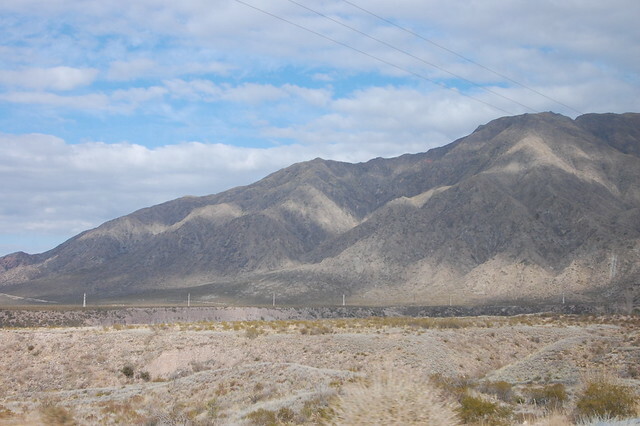 This photo of the hills only hints at the actual beauty of the ride. It is magical passing though these mountains. Our bus was nearly empty and I kept jumping around to each side of the bus to look at the scenery. Cacheuta is a very small town with lots of restaurants and resorts catering to the tourist that just wants to relax. 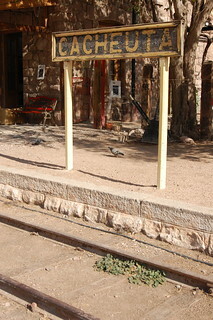 They still have the railroad sign marking the town, even though the trains no longer run through here and the depot has been converted into a restaurant. It is easy to find Termas de Cacheuta; just wander along the main road until you see the biggest spa complex, or ask for directions. Termas de Cacheuta is comprised of about seven different thermal pools, some inside a heated greenhouse-like room, and others outside in the sunshine, as you see in my photos. You are encouraged to enjoy the baths in order of warmth, working up to the almost painfully hot indoor bath. I spent most of my time enjoying the outdoor pools on my own and chatting with the other guests; they’re always amused to meet an American who speaks so much Spanish. 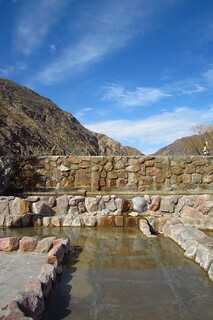 Later, I inched my way into the super hot pool, trying to allow the purification to take place. I don’t understand much about the therapeutic benefits of thermal baths, but I certainly like the idea! I also crossed this suspended footbridge connecting the residential part of Cacheuta with the commerical side. There’s a paved road nearby that runs parallel, but this footbridge was way more fun! 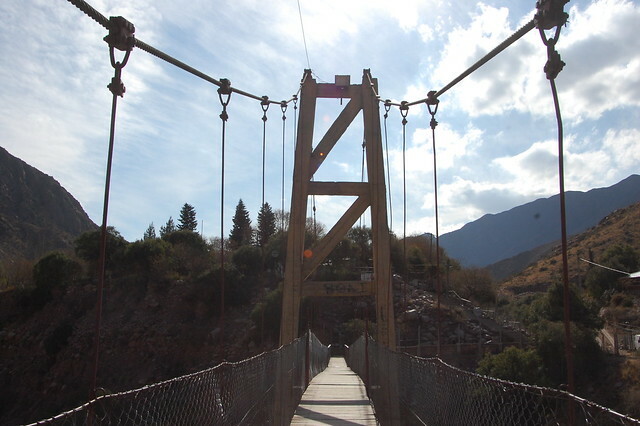 At this point, I’d exhausted all of the options in Cacheuta and was ready to head back to Mendoza. Back at the bus terminal, I bought my ticket onwards: I’d finally decided to head to Santiago to explore Chile’s capital and spend some time with former students-turned-friends. However, I still had one last day planned in Mendoza, and it was an exciting one: I was heading out to Luján de Cuyo to visit my favorite winemaker! 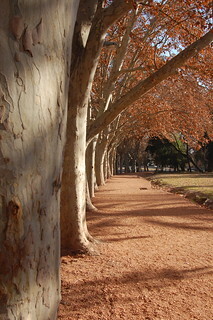 Plaza Italia is the main plaza in Mendoza, and is definitely worth a visit. It has a gorgeous fountain, lots of trees, and plenty of benches and grass to relax in. There is often an artisan fair around the edges of the plaza, if you’d like to buy handmade artwork and jewelry from talented Argentines. 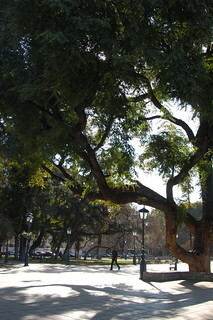 Parque San Martín is a great place to spend a morning or afternoon. You could also go running there or take one of the free classes offered in the park. Buses to Cacheuta run from the main bus terminal in Mendoza and leave at 9AM, 10:30AM, and 1:30PM. They return at 3:45PM, 6:30PM, and 9:20PM. There may be additional service around the holidays – check the schedules posted inside the bus terminal. In Cacheuta, the schedule is posted in the office window along the main road. The buses are located in the central part of the terminal. You can buy your tickets in advance or on the bus. The ride is about 90 minutes long. The road trip bus ticket was $23 Argentine pesos in 2013. I thought leaving at 10:30 and returning at 3:45 was more than enough time in Cacheuta. Most people who visit Cacheuta go to Termas de Cacheuta, as it is very modern and attractive. There are lockers and showers inside and various necessary items for sale or rental. There are also picnic tables for enjoying food with your friends and family, so think about packing a lunch and making a day of it! As mentioned above, there a number of thermal baths of all temperatures and some reserved for only adults, so you’re likely to find a pool that is less crowded and comfortable for you. A one-day adult entry cost $55 Argentine pesos in July 2013. You can save a lot of money by bringing your own lunch or snacks and eating at the many picnic tables around the Termas. There are a number of restaurants lining the main streets but they are definitely priced for tourists.